They must then sort out the clues to work out the proof (the clues earned must correspond to the images shown on the tokens placed next to the game board). The game lasts a variable number of turns depending on the number of players. The spy with the most points when the game ends wins. 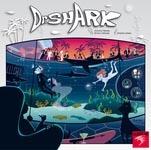 Add a Review for "Dr. Shark"